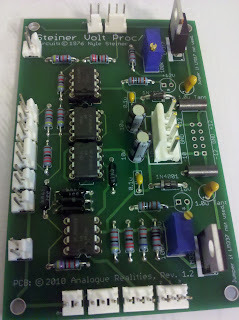 The Voltage Processor/Mixer is basically what the name implies: a module for processing and mixing control voltages. Like many modulars from the 70s it has options that allow the voltages to be combined in slightly unusual ways - or at least unusual compared to many of the more straightforward modules available today. Buchla had its model 257 Voltage Processor which included various scaling, inverting, and other features. Aries had its AR-323 Dual Mixer which allowed for various inversions, and adding & subtracting the two mixer outputs. Serge probably had the most straightforward of the voltage processors, which featured bipolar attenuators on the inputs, mixed them, and allowed the addition of an offset voltage - most modern CV processors are similar to this. Of course, other unusual things can be done, but most often in conjunction with other modules. 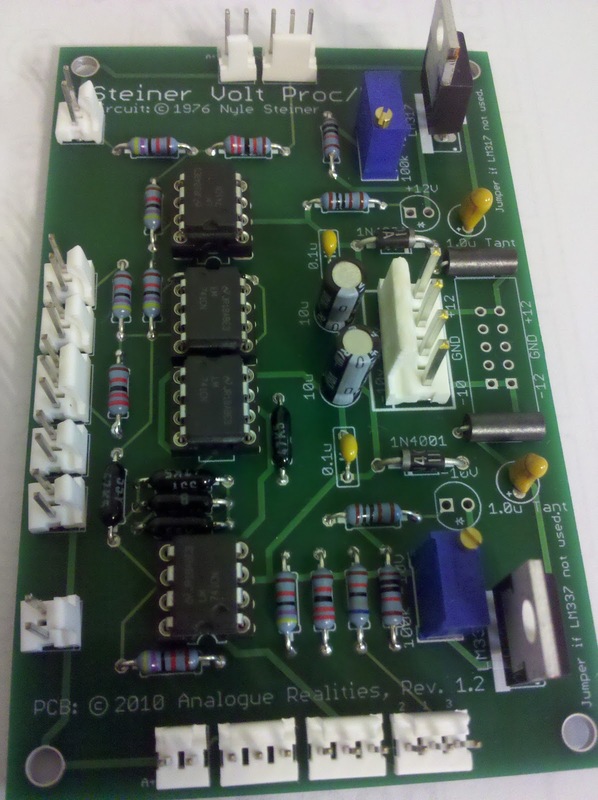 The Synthasystem Voltage Processor/Mixer has three pairs of inputs, and two outputs. Each of the input pairs features one attenuated input, and one unattenuated input. The pairs are applied differently (inverted or non-inverted) to the two outputs based on their naming (A+ B-, A- B+, A+ B+), and an offset voltage can be applied to both outputs as well. Note that the offset voltage ranges from -10V to +12V - an extremely wide range! If you're not building this into a Synthasystem, but as a stand-alone module for a Eurorack or other system, you may consider adding a couple of resistors to cut that voltage range down. It is a pretty straight-forward circuit, using four inverting op-amps to sum everything at different points. A few of the resistors need to be 0.1% tolerance, and those are the black ones seen in the picture. Some of them need to be 47k, while the summing & feedback resistors on IC1 can be anything from 10k-47k (of course, though, all the same!). I chose 47k, since I was already buying a bunch of them.